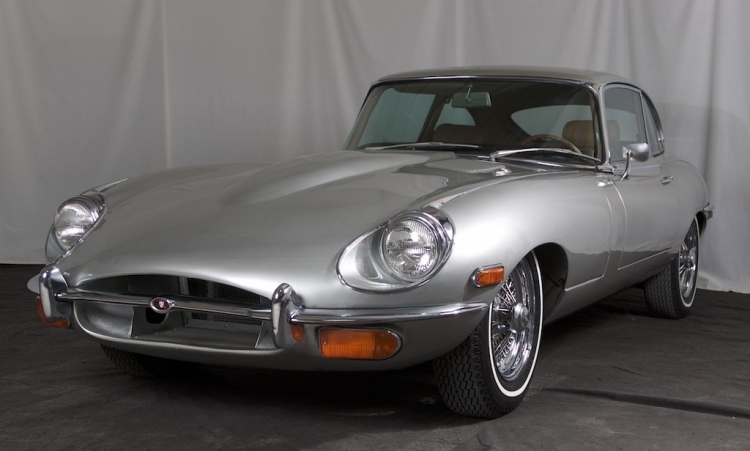 This 1970 Jaguar XKE SII 4.2 is finished in Silver with a Tobacco interior. The Series II Jaguars benefitted from more user-friendly mechanical improvements such as improved cooling and bigger brakes, plus options like power steering and A/C became available. The Jaguar XKE series II is powered by a 246hp inline 6 cylinder engine with a 3 speed automatic transmission. This example is non numbers matching. The early history of this car is not known, although it does retain an original blue California license plate. The car was purchased by its current owner about 5 years ago whom immediately set out to make this a very useable daily driver. Originally Sable brown, this car was repainted its current color four years ago. The current owner has done extensive service and enhancements to make the car a useable classic. Most significant work completed by British car specialist Delong's Automotive in Cambell, CA in 2014. - Clean, paint and install motor and transmission. Correct block with Triple SU carburetors. - Mounted new brake master cylinder.- Fit upgrade A/C- Send out Fuel Tank for cleaning and lining. Factory A/C upgraded by Retro Air. - Replace Cap and Rotor, Ignition Wires and Spark Plugs. Set Ignition timing and Tripple SU Carbs including Choke Linkages. - New Fuel Gauge Sending Unit. Over $44,014.00 in receipts spent on upgrades and service in the last 4 years. Interior is redone and looks basically as new. Moto Lita Steering wheel. All gauges are in good working order. A great looking E Type that is ready to be used and enjoyed. California titled and current registration.